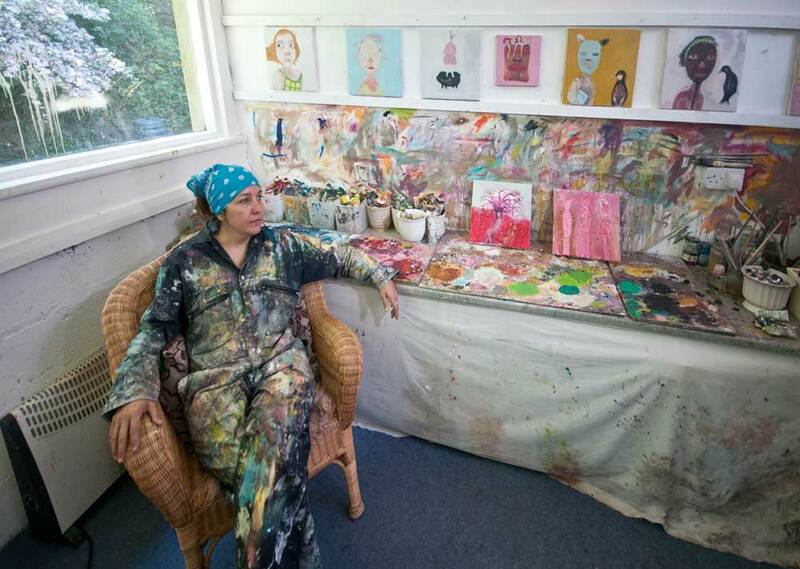 Siobhan in her studio at Krowji. I paint in oils on canvas or board. My surfaces build up a history. I like to give a sense of vulnerability on the surface with a feeling of strength underneath, revealing the history of the earlier layers. Sometimes areas of the paint have a crayon-like effect, which enhances the childlike qualities I aim for. It is important to me to have a good subject / narrative. I like to paint people, particularly children, and animals. I am constantly scanning everyday images and looking for the one that makes a great painting. If an image is fresh in my mind, I can’t paint it. I have to live with it for a while and forget. Given time, it will re-emerge naturally. That’s when I relive the experience through painting. This creates the dreamlike qualities I look for. I love to explore personalities and caricatures. I feel that body language can say so much. I often use animal features combined with human figures to enhance expression of character and to create an element of extended reality, emphasising the dreamy qualities of my work.